All income investors can agree that safe and rising income is a top priority when choosing dividend stocks. That’s especially true for retirees or those near retirement, who are counting on steady passive income to help pay the bills during their golden years. This is why most conservative high-yield investors generally stick to non-cyclical industries when looking for good investment candidates. However, even cyclical industries such as energy can sometimes offer great high-yield income growth opportunities that shouldn’t necessarily be ignored. In recent weeks, the price of oil has crashed into a bear market, causing several readers to ask me to offer some top picks for taking advantage of the rapid decline in crude. 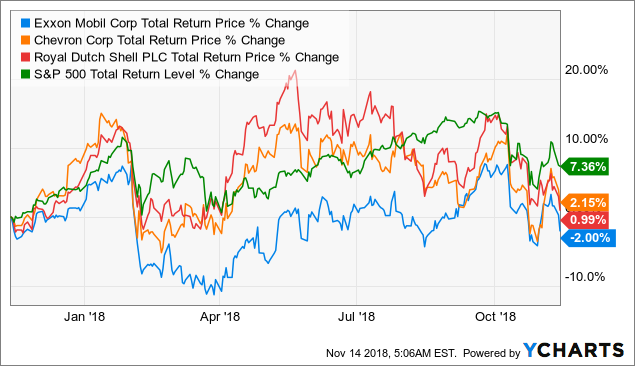 So, let’s take a look at not just what’s causing oil prices to dive off a cliff, but why Exxon Mobil (XOM), Chevron (CVX), and Royal Dutch Shell (RDS.A) (RDS.B) are three of the best high-yield choices for conservative income investors. Not just have these three oil giants proven they can deliver safe income (and good total returns) for decades in all manner of oil price environments, but there are five reasons I expect them to continue to do so for the foreseeable future. What’s more from current prices, all three are likely to deliver market-beating returns as well, though Exxon Mobil is my top pick among these three blue-chips for new money today. In recent weeks, the global oil standard, Brent, has flirted with bear market territory. West Texas Intermediate, the US oil standard, has had it even rougher. 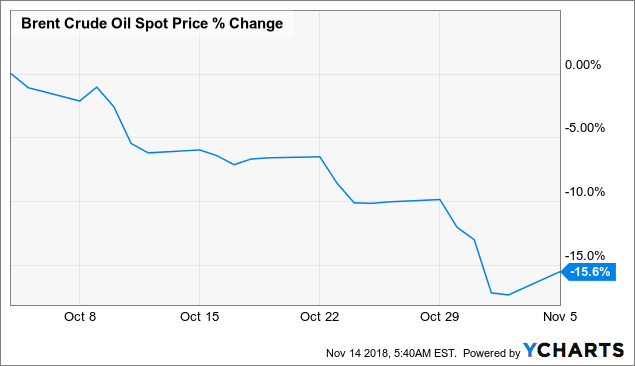 On Monday, November 13th its price plunged nearly 8%, the worst single-day decline in over three years. And that previous decline was during the second worst oil crash in over 50 years, in which crude eventually plunged as much as 76%. In fact, WTI has now fallen for 12 consecutive days, which is the longest losing streak ever, or at least since oil futures began trading in 1983. WTI is now at $56, off $20 or 26% from its recent four-year high of $76. That places US oil firmly in a bear market. What’s causing oil prices to tank so hard and fast? Three things mainly. In the short-term, there are the Iranian sanctions that were supposed to go into effect on November 5th. Previously some analysts had warned that these could take up to 2 million barrels per day or bpd off the global oil market in a matter of weeks. To offset this, Saudi Arabia and Russia agreed to increase daily production by 1 million bpd to stave off a sharp spike in oil prices. However, thanks to President Trump granting six-month oil importation waivers to eight major oil importing countries (ironically enough that includes China), that big supply disruption hasn’t occurred. Now, Saudi Arabia has said that it will cut production next month by 500,000 bpd to help stabilize crude prices. However, that decline in supply is being offset by continuing strong growth in US shale production, which the EIA just reported hit a record high of 11.6 million bpd. That’s up 2 million bpd in the past year and is putting the US on track to potentially exceed the EIA’s 2019 US year-end production forecast a year early. According to OPEC’s latest forecast, US shale is expected to drive 2.23 million bpd of new supply in 2019. Finally, you have rising fears of less rapid oil demand growth next year over concerns that the world economy is slowing. For instance, OPEC’s latest 2019 oil demand growth forecast is down 70,0000 bpd to 1.29 million. That might not seem like much but what has the oil market worried is that it’s the fourth straight monthly growth forecast decrease. Back in July, OPEC said it expected 2019 global demand for crude to rise by 1.45 million bpd. That 11% decrease in expected demand growth has the oil futures market concerned since crude is priced at the margin, thus the reason for its extreme volatility. So, does this current short-term supply glut, which Wall Street fears might become protracted, mean another oil crash in coming? Most likely not. That’s because there are major differences between today and the events that led to the oil crash of mid-2014 to early 2016. Most notably back then OPEC threw open the taps to try to drown US shale producers in an ocean of cheap crude. That was because at the time US oil & gas companies were spending not just all of their cash flow to ramp up production but also taking on mountains of debt (because of record low interest rates). At the time, OPEC (and most analysts) estimated that break even shale oil production prices were about $80. So, OPEC gambled that it could quickly bankrupt the industry that was blindly hiking production and stealing its market share. Today, despite continuing to raise production, most oil companies (who have spent the last four years aggressively deleveraging) are committed to funding production growth with operating cash flow and maximizing returns on investment, not growth for its own sake. In addition, breakeven prices for US shale have proven to be far lower than earlier forecasts (as low as $27 for some formations). OPEC now realizes it can’t bankrupt the US shale industry, at least not unless it also guts its own finances. That’s why Khalid al-Falih, Saudi Arabia’s oil minister, said on November 13th. that OPEC (and Russia which has effectively joined it via the so-called “Vienna Consensus”) might cut production 1 million bpd. Note that this 1 million bpd cut would be enough to totally offset the supply glut caused by next year’s non-OPEC production increase. This shows that the world’s major oil producers are NOT looking to repeat the oil price war they kicked off in 2014. But what about soaring US supply? Well while that has indeed been impressive, consider this. According to the International Energy Agency or IEA 52% of the world’s oil supply is currently coming from legacy fields that are, on average, seeing 6% annual decline rates. This means that just to maintain global supply at current levels requires about 3 million bpd of new production to come online each year. 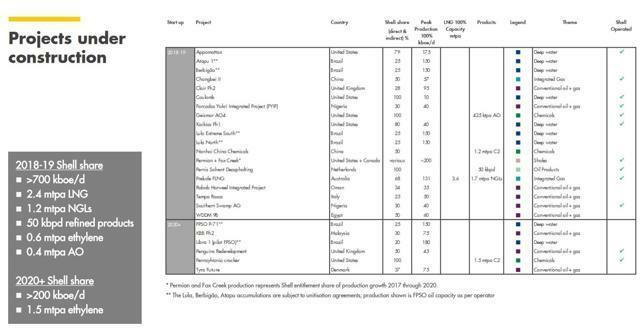 And according to some analyst estimates, the total amount of new production set to come online each year from currently announced oil projects between 2019 and 2022 is just 1 million to 1.5 million bpd. OPEC estimates that, due to pipeline constraints, US total production, driven mostly by shale, will hit 13.4 million bpd in 2023. That amounts to long-term US oil production growth (over six years) of about 1 million bpd. 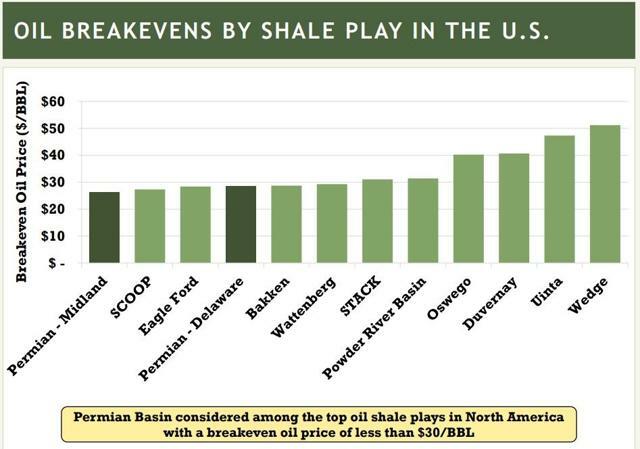 Which means that even US shale, as might as it is, probably won’t be enough to even close the necessary production gap just to keep current global production steady. Factor in continued (though slower) oil demand growth over the coming years and you get a scenario where another oil crash (to $30 or below) is extremely unlikely. In fact, taking a longer-term view another major oil crash also seems even less likely. That’s because, according to the EIA, 80% of all new production growth through 2040 will merely offset the natural decline rates of legacy oil fields. As a result, Exxon estimates that the oil industry will need to invest $400 billion annually over the next 22 years ($8.8 trillion in total), just to allow supply to match demand. That is far less spending than what’s currently planned meaning that the long-term outlook for oil prices remains higher, not lower. However, let’s say I and most analysts are wrong. After all, the oil market has been befuddling nearly all attempts to forecast prices for nearly 150 years. Say that we do have another oil crash. Even then, there are numerous reasons that Exxon, Chevron, and Shell are likely to prove great sources of safe and even rising income for retirees. The first thing income investors should look at with any long-term investment is the dividend track record. You at least want to see a company, even an oil major, able to sustain its payout in all economic, industry, and interest rate environments. Better yet, you’d like to see dividends grow every year, which can help you sleep well at night no matter what the stock price or commodity prices are doing. Shell’s dividend track record is the third best in the industry, with the company maintaining or growing its payout every year since WWII. Note that Shell did pay part of the dividend in stock during the oil crash, but in late 2017 returned to full cash payouts. However, considering that most oil companies were slashing or eliminating their payouts at this time, this is still a very impressive long-term track record. Especially given that a repeat of the last oil crash isn’t likely anytime soon. Meanwhile, Chevron’s dividend track record is even better, thanks to 32 consecutive years of dividend increases that makes it one of just three oil industry dividend aristocrats. Exxon is also an aristocrat, having raised its dividend every single year since 1983. That 35-year payout growth streak is the second longest in the oil industry (HP has been raising since 1973) and is but one reason that the stock is so trusted by conservative income investors. These three companies’ dividend track records are even more impressive when you consider the context in which they were created. Specifically, they have been maintaining, or growing dividends every year even during prolonged periods when oil averaged about $15 (much of the 1990s), interest rates were as high as 12%, and when financial markets almost completely froze up during the Financial Crisis. This shows that, barring an even worse recession than 2008-2009, none of these companies is likely to cut its payouts or break its dividend growth streaks. That’s due to their industry leading balance sheets, which for oil companies is the most important dividend safety factor. Because oil is a depleting asset, even during commodity crashes, when revenue, earnings, and cash flow fall off a cliff, oil companies must continue to invest billions into growth projects. This means that maintaining or growing dividends, plus growth capex, must be largely funded by debt. As a result, the number one thing conservative income investors need to focus on is an oil company’s balance sheet. Specifically, five key metrics are important to know, which shows how likely it is that an oil company can ride out a protracted industry and or economic downturn. These are the debt/EBITDA (leverage) ratio, the interest coverage ratio (operating cash flow/interest), the debt/capital ratio, the credit rating, and the average interest cost. Royal Dutch Shell has the highest leverage ratio of these three blue-chips, but still far below the industry average. Chevron and Exxon, not surprisingly, maintain the most conservative leverage ratios in the industry. 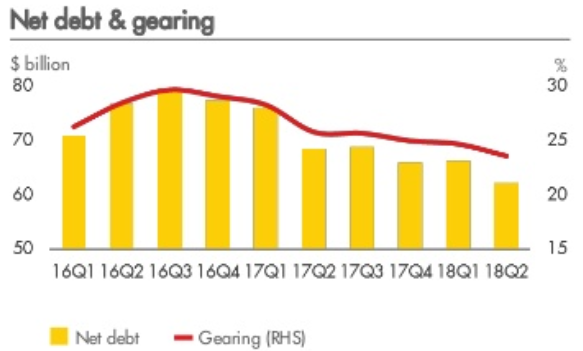 Shell’s relatively high debt (among these three) is mostly due to the 2015 $70 billion acquisition of BG, which included a lot of debt assumption but also made Shell the world’s largest liquified natural gas or LNG company. Management has stated it’s making paying down its debt a priority and is targeting a long-term debt/capital ratio of 20%. The company has managed to steadily pay down its debt, which it began to do as soon as oil prices started to recover. But even at current levels, Shell’s cash flow is sufficient to cover its interest costs 23 times over, more than double the industry average. Chevron and Exxon’s interest coverage ratios are sky-high, which is why each enjoys such strong credit ratings. Shell’s rating was just upgraded by S&P to match Chevron’s for the second strongest in the industry. As a result of their strong balance sheets, all three companies can borrow at low interest rates. However, Chevron and Exxon have been the best at minimizing interest costs thanks to taking advantage of foreign bonds because interest rates overseas are still near zero. Ultimately this means that Chevron, Exxon, and Shell should have no trouble maintaining and growing their dividends, while still investing in future growth. That’s great news because all three companies have solid long-term growth plans that should ensure years, if not decades, of generous, safe, and rising dividends. Exxon Mobil has frustrated investors for years, thanks to upstream (oil & gas) production being essentially flat at 4 million bpd over the past 10 years. However, Morningstar analyst Allan Good actually has a very different take on the company. I happen to agree with Mr. Good and consider Exxon my favorite oil major. That’s for several reasons including the strongest balance sheet in the industry, the second best dividend growth track record, and its superior historical returns on capital. Despite what investors might have thought of former Exxon CEO Rex Tillerson (CEO until early 2017), the man did lead Exxon to the best long-term returns on capital of any oil major. And under his watch, despite some botched acquisitions (which all oil companies occasionally make), Exxon reported the smallest impairments (losses on investments) of any of its peers. But new CEO Darren Woods (a 27-year company veteran) has a very different vision for Exxon. He still plans to focus spending on the highest return projects, but unlike Tillerson, is very much pro production growth. That’s thanks to what management calls the best long-term investment opportunities in 20 years. During the Q2 conference call, Woods told analysts that Exxon was on track for its extremely ambitious growth plans. What are those growth plans? Well to take advantage of the industry’s deeply inadequate capex spending, Exxon is being contrarian and plans to jack up its growth spending in a big way. Increase production 25% from 4 million bpd oil equivalent to 5 million bpd oil equivalent. Increase chemical production by 30% (40% in North America and Asia). Achieve 20%, 20%, and 15% ROIC on production, refining, and chemical, respectively. Double earnings from refining and chemical. Triple earnings from oil & gas production (at $60 oil). Overall the company thinks it boosts the company’s returns on capital from 7% in 2017 to 15% in 2025. While that’s slightly below its 10-year average, it would still make Exxon the second most profitable oil company (based on this important metric) behind Chevron. More importantly for income investors, it would mean a massive increase in cash flow. Retained FCF is free cash flow (what’s left over after running a company and investing in future growth) minus the dividend cost. Even accounting for Exxon’s likely 6% to 7% dividend growth through 2025 ($20 billion annual dividend cost in 2025) the company will still likely have enough to meet its ambitious future spending plans while maintaining a fortress-like balance sheet. But how exactly does Exxon plan to achieve such impressive and profitable growth? 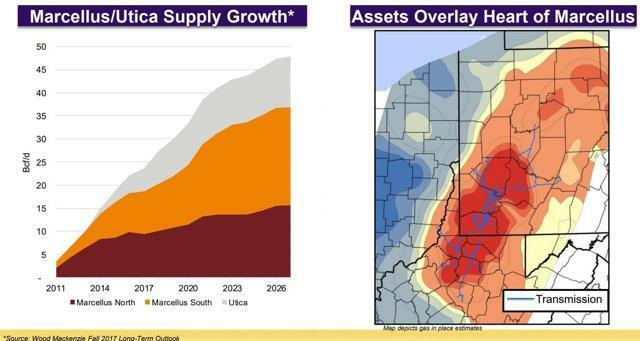 One strategy is to increase production from its US shale acreage. Exxon estimates that it has about 10 billion barrels of reserves locked up in US shale that can generate 10% or better returns even at $35 oil. 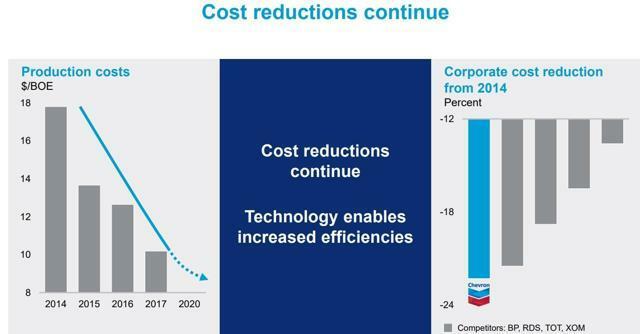 In fact, thanks to fracking 3.0 technology (which includes AI driven real-time drilling analysis), Exxon thinks it will be able to lower its break-even cost on US shale to just $20 per barrel over the next six years. A big reason for that is the superior economics of the Permian Basin, where multiple layers of oil-bearing rock are tightly stacked on top of each other. In 2017, Exxon spent $6.6 billion to acquire Bass Energy Holdings, which doubled its Permian reserves to about 6 billion barrels. Since then both further bolt-on acquisitions, as well as organic discoveries, have increased those reserves a further 66%. Exxon expects that by 2025 its Permian production will have increased five-fold, and all while generating exceptional returns on capital (30+%). But the Permian is expected to account for just 60% of Exxon’s 1 million in daily oil production growth. The remaining oil increases are coming from several of its very promising global growth projects. One of the most exciting is Guyana, the small South American country. Exxon had previously announced eight major oil discoveries off that country’s coast totaling four billion barrels of recoverable oil. That figure is actually likely to rise since Exxon just announced a 9th major Guyana offshore discovery. Management is so confident that even more oil pockets remain to be discovered that it has deployed a second exploration ship to the country to keep looking for even more offshore deposits. 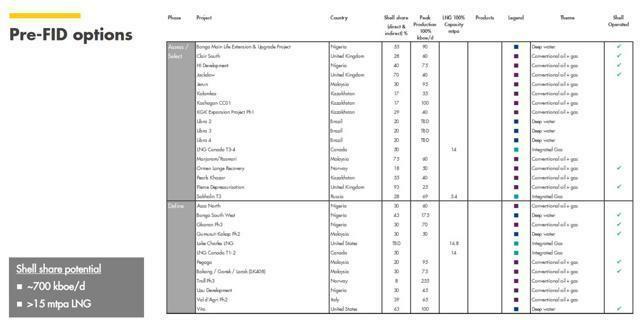 Now it’s important to note that Guyana is still an early project for Exxon. 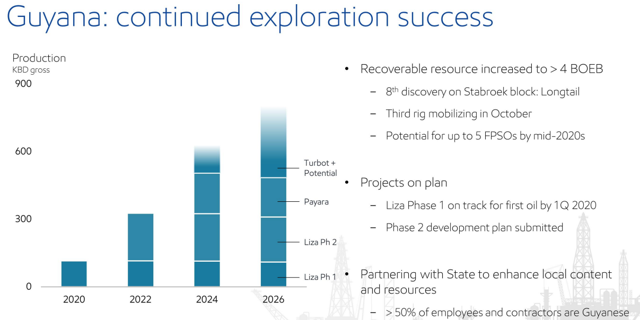 Production is expected to start in 2020 and hit just 100,000 bpd by the end of that year. But by 2026 (beyond Exxon’s current mega-growth plan) Guyana production is expected to rise 700% to 800,000 bpd. And if the company keeps finding new deposits that figure could ultimately rise to 1 million bpd or more over time. For context remember that Exxon’s entire seven-year growth plan calls for 1 million bpd in extra production meaning that Guyana alone would be enough to get the company the majority of the way there, even account for ongoing natural depletion from existing wells. The next major growth opportunity is Brazilian offshore. Since the oil crash, Exxon has managed to lower production costs for offshore drilling that even at $40 oil (40% lower than current price) it expects to be able to generate at least 10% returns on its Brazilian operations. But as if the Permian, Guyana, and Brazil weren’t enough Exxon is also planning to give Shell a run for its money in terms of trying to become the world’s largest producer of LNG. Exxon is currently working on two major LNG projects in Papua New Guinea and Mozambique that could potentially boost its 2025 LNG capacity to double that of its nearest rival today. The bottom line is that Exxon today offers investors a great opportunity to benefit not just from a generous, safe and growing dividend, but also has the long-term vision to deliver some of the industry’s best dividend growth long into the future. Chevron is my second favorite oil major and might one day even top Exxon for my number one pick in the industry. That’s because, like its slightly larger aristocrat cousin, Chevron has a proven shareholder friendly track record of dividend growth, but also excellent long-term capital allocation resulting in great returns on investment. New CEO Mike Wirth (who took over in 2018 and has been with Chevron for 26 years), has outlined the most conservative capex plans of any of these three companies, just $18 to $20 billion per year through 2020. However, thanks to putting that money to good use (75% of capex will be producing cash flow within two years) in its best growth opportunities in the Permian Basin, Gulf of Mexico, West Africa, and Western Australia, the company expects that to drive industry-leading production growth of 4% to 7% annually. 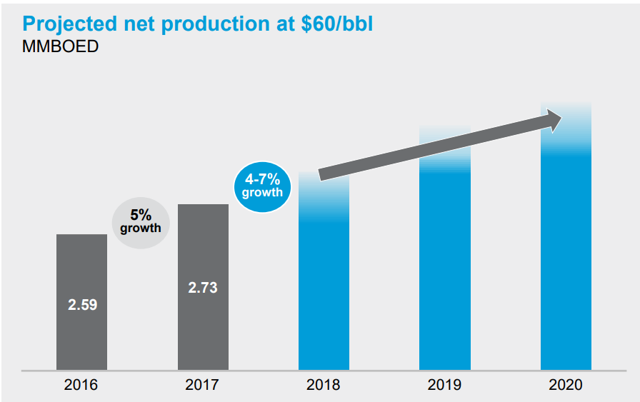 Chevron has been killing it in 2018, thanks to superior execution allowing it to update its 2018 production growth guidance to 7%, the top end of its medium-term plan. And that’s even accounting for continued non-core asset sales. Chevron’s Q3 production soaring 9%, mostly thanks to the company’s booming Permian operations. Chevron owns 1.7 million net acres in the Permian, which is the crown jewel of its shale assets. Those assets include an estimated 17.5 billion barrels of recoverable oil equivalent, about 25% of the company’s total reserves. Chevron has been steadily adding to its Permian acreage, including 70,000 acres in 2017 and plans to buy 90,000 more in 2018. Chevron’s love of the Permian is for the same reason that Exxon is so bullish on the formation. Massive, low-cost reserves that allowed the company’s Permian production to grow by 80% YOY in Q3. In fact, Chevron’s Permian production of 338,000 bpd in the last quarter was over 100,000 bpd more than its previous guidance back in March. The oil industry has high amounts of execution risk (bringing projects in on time and on budget) and so far, the Permian is allowing big oil to not just meet expectations, but exceed them by a country mile. Analysts currently expect Chevron’s Permian assets to be able to more than double in the coming years, to 700,000 bpd. But Chevron is far from purely focused on US shale oil in the Permian. It also owns 873,000 net acres in the hyper-prolific Marcellus/Utica shale of Pennsylvania, Ohio and West Virginia. Production in both formations is growing like a weed and that’s expected to continue for the foreseeable future. While natural gas is not nearly as profitable as oil, the reason that Chevron still invests heavily in it is that gas has a much longer growth runway than crude. According to the EIA, US oil production is expected to peak in 2030 and then start declining around 2043. But thanks to strong export demand growth from emerging markets like Mexico (gas), and India and China (LNG), US gas production is expected to keep growing steadily through at least 2050. But it’s not just US gas that Chevron is planning to grow its production in. Like Exxon and Shell, Chevron is betting big on the future of LNG. After several years of costly delays and cost overruns, the Australian Gorgon and Wheatstone LNG projects are now complete and ramping up quickly. By the end of the year, Chevron expects these two projects to be generating the equivalent of 400,000 barrels of oil. Those projects are price indexed to oil (thus higher margin) and expected to see minimal depletion rates over the next 20 to 25 years. But production growth for its own sake is worthless to income investors. Cash flow, especially free cash flow, is king. Which brings me to the other major reason I like Chevron so much. Chevron has been among the most aggressive cost-cutters among the oil majors and by 2020 expects to lower its average production cost 50% compared to 2014. Combined with strong medium-term growth in production that equates to very strong growth in operating cash flow, and even better growth in free cash flow. Even assuming just $60 oil by 2020, Chevron estimates that its free cash flow will increase 30% between 2017 and 2020. That’s the biggest FCF increase of any oil major and Chevron is currently beating that impressive guidance by a wide margin. Specifically, higher oil prices have allowed it to generate $14.3 billion in FCF in the past 12 months, compared to just $9.2 billion forecast for the end of 2020. The company’s river of FCF is what allowed it to pay down $2.4 billion in debt in Q3 while also buying back $750 million in stock (part of a $3 billion buyback authorization). Ok, so maybe Chevron is having a great year, but what about if oil prices crash below $60 and stay there? Well the good news is that, even without asset sales, Chevron’s lean operations can sustain the dividend at $50 oil. That’s a level that the Russia and Saudi Arabia won’t likely allow it to fall below. And since oil is likely to go higher in the coming years, not lower, that bodes well for Chevron returning to its former industry leading dividend growth rate. Beyond 2020, Chevron is going to need to accelerate capex spending, since the strong production growth is mostly being driven by earlier projects and the Permian. But even over the long term, analysts expect Chevron to deliver 4% production growth and industry leading 20% returns on capital (by 2020). If Chevron can indeed pull that off, it will overtake Exxon as the highest-quality oil blue-chip you can own. Shell is still an oil company and so part of its $25 billion to $30 billion in annual capex spending over the coming years will be focused on increasing oil production by 1 million bpd or 25% above 2017 levels. However, while that kind of production growth is impressive enough for an oil major, Shell’s biggest growth efforts are focused on boosting its LNG capacity by 50%. That’s because, while oil demand growth is expected to continue rising for decades, gas demand is expected to rise much faster. The reason that Shell is so gungho on LNG specifically is that it’s the most cost-effective way for transporting large amounts of gas around the world (LNG is 1,000 times denser than natural gas in its standard form). Asian gas demand is expected to grow 3% annually through 2035, which is three times the growth rate of energy in general. 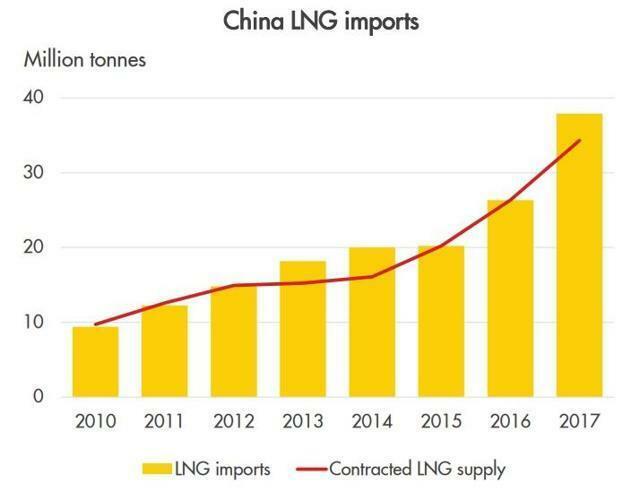 In fact, Shell expects that global LNG demand will be the fastest growing part of the fossil fuel industry, courtesy of Asia’s enormous demand growth, mostly due to emerging markets like China and India. Shell’s LNG focused growth strategy began in 2012 when it began construction of the $12 billion Prelude floating gasification ship (Shell owns 68% of the project). The Prelude is 1601 feet long, displaces the equivalent of six US supercarriers and is now complete and generating LNG 300 miles off the coast of North Western Australia. 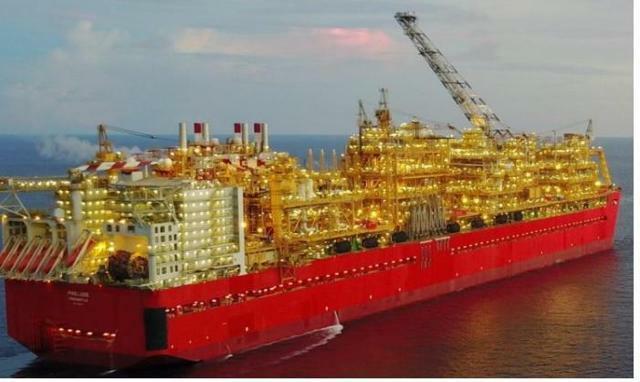 Shell expects to keep the ship there for the next 20 to 25 years where it will feed off cheap natural gas and produce 5.25 million tons per annum or MTA of LNG, gas condensates, and liquefied petroleum gas. This will then be shipped to export markets in Asia, mostly via Shell’s own LNG tanker fleet (it owns 20% of the world’s LNG tankers). 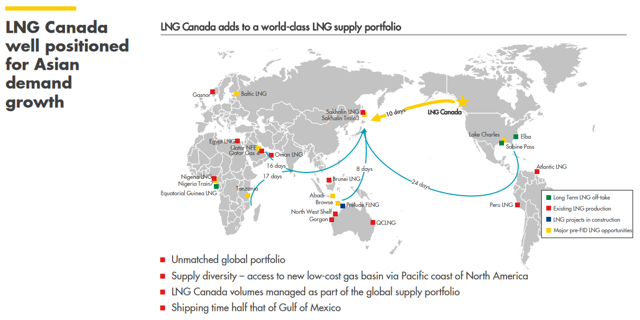 Which brings us to the second part of Shell’s LNG pivot. That would be the BG acquisition which made Shell into the world’s largest producer and shipper of LNG. While that deal involved a lot of stock, Shell has said it will buy back $25 billion worth of shares between 2017 and 2020 to neutralize that dilution. Ultimately, the BG acquisition is likely to prove a big win because it has made Shell the top name in global LNG (for now). The company plans to pad that lead via even bolder investments by recently announcing it will be going forward with LNG Canada. This joint venture is already included in the company’s annual capex budget and expected to generate 14 million MTA of low-cost LNG. That will then be exported to Asia, at about 5% lower overall cost (including shipping) which gives Shell a major competitive advantage over rival LNG shippers operating from America’s Gulf Coast. Shell expects to generate about 13% returns on capital from this project, which is above its 2021 target of 10% return on capital company wide (up from 8% in 2017). As a result of its strategic growth plan, Shell expects to be able to average $25 billion in annual free cash flow between 2019 and 2021 at $60 Brent oil, and $30 billion at $65 crude. Today, Brent is $66, and most analysts think it’s likely to average around $73 over the next few years. Note that assuming Shell’s forecasts come true its dividend payout ratio will fall to 47% to 56% during the next few years. However, should Brent indeed average $73, then Shell is likely to enjoy even greater FCF, courtesy of its impressive cost discipline (production costs are down 35% since the oil crash and overall capex spending is 40% lower). That potentially greater FCF would then be funneled into larger dividend hikes (though still modest) and more aggressive share buybacks. Note also that Shell has stated it plans to invest $1 to $2 billion per year into alternative energy, as it starts planning for a post-fossil fuel world. Management expects its “new energies” segment to generate 8% to 12% returns on capital, in line with its overall company profitability. 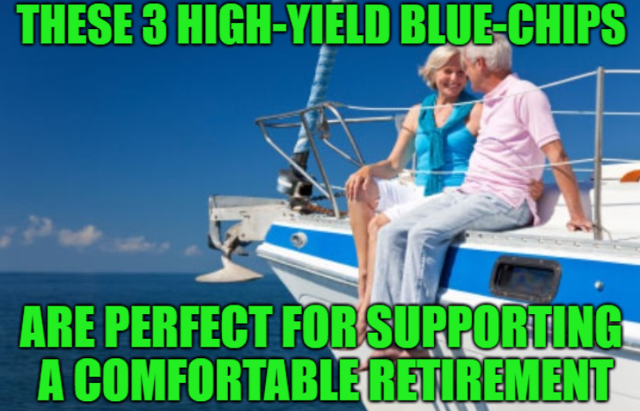 The bottom line is that all three of these oil blue-chips have ample financial resources to fund aggressive growth in their businesses, all while also delivering generous, safe and rising income over time. That in turns should also allow them to generate marketing-beating total returns. The most important part of any income investment is the dividend profile which consists of three parts: yield, safety, and long-term growth potential. Combined with valuation it’s what tends to drive total returns. All three oil giants offer very attractive yields, at least double that of the S&P 500. More importantly, those dividends are low-risk thanks to sustainable FCF payout ratios and fortress like balance sheets. Over the long term, Exxon and Chevron are likely to continue their historical 6% to 7% dividend growth rates, courtesy of their robust FCF. Shell on the other hand, represents a tradeoff. You get a much higher yield today, but much slower historical long-term dividend growth. Given management’s priorities (deleverage and buybacks first through 2020), I don’t expect Shell to deliver more than about 2% payout growth, essentially offsetting inflation. Combining yield with long-term dividend growth (Gordon Dividend Growth Model, effective for dividend stocks since 1956), we can estimate what each company’s long-term total returns will likely be from fair value. Exxon and Chevron are pretty evenly matched with Shell bringing up the rear with about 8% return potential. That’s below the S&P 500’s 9.2% historical total return, but likely to beat the market over the next five to 10 years. That’s because Morningstar, BlackRock and Vanguard expect just 0% to 5% CAGR total returns from the market over that time. However, those expected total returns are from fair value, and when we adjust for valuations we find that, Exxon, among these three blue-chips, becomes the best stock you can buy today. Thanks to the recent plunge in crude prices, all three stocks are underperforming the S&P 500 over the past year. But for value investors such underperformance merely presents better buying opportunities. There are many ways to value a stock, but for dividend blue-chips, one in particular has proven highly effective since 1966. It’s called dividend yield theory or DYT, and it’s been what asset manager and newsletter publisher Investment Quality Trends has been exclusively using to beat the market for decades (and with 10% lower volatility to boot). DYT works well for stable dividend stocks whose business models (and growth rates) don’t change much over time. It compares a stock’s yield to its long-term historical norm to determine whether or not a stock is overvalued, undervalued, or fairly priced. That’s because dividend stocks tend to have mean reverting yields that cycles around a relatively fixed point over time. Thus, their historical yields can be thought of as a “fair value yield” at which buying a quality company is a good idea. For my fair value yield, I take the midpoint between a stock’s five year average yield and 13 year-median yield. That gives you a more accurate sense of what the market values each company at across various economic, industry, and interest rate environments. Today, Chevron’s and Shell’s yields are trading slightly above their fair value yields indicating both are good buys. 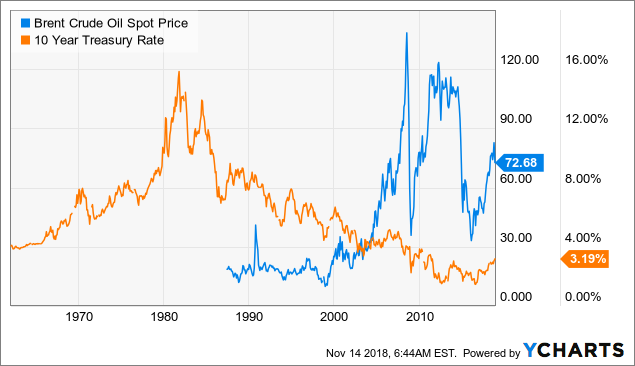 However, Exxon’s yield is far above its historical yield meaning it’s the most undervalued of the three. At today’s prices, I wouldn’t expect much valuation boost from Shell and Chevron, but Exxon is likely to outpace its cash flow and dividend growth significantly (about 3% CAGR over the next decade). Add in this long-term valuation boost to the current yield and long-term dividend growth rate (valuation adjusted Gordon Dividend Growth Model) and Exxon offers the best total return potential by far. That’s not to say that Chevron and Shell won’t generate decent returns as well, but for new money today I consider Exxon the best option for conservative high-yield investors. Of course, that’s only if you’re comfortable with the rather complex risk profile that comes with owning any oil stock. While Exxon, Chevron and Shell are the lowest risk dividend blue chips in the industry that doesn’t mean they don’t still have a complex set of risks that investors need to be comfortable with. The first is, of course, that their sales, earnings, and cash flow are highly dependent on oil & gas prices, which as we’re seeing now is extremely hard to predict. And given the capital-intensive nature and long lead times for major production growth projects, that can make profitable long-term capital allocation decisions challenging. For example, ConocoPhillips’s (COP) proprietary long-term oil forecast model shows that oil could realistically average anywhere from $40 to $82 per barrel by 2025. The actual price will depend on hundreds of factors including long-term growth rates in the global economy, the rate of alternative energy adoption, and how quickly US shale production ramps up and for how long. And that’s just a few of the things that oil companies must guesstimate when making their long-term investing plans. Analyst and government agency models are similarly volatile and uncertain. For example, last year, analyst firm McKinsey, in its long-term (through 2050) energy industry report, estimated that peak global oil demand might come as early as 2030. That’s far quicker than most large oil companies (and government agencies) expect (the 2040’s). 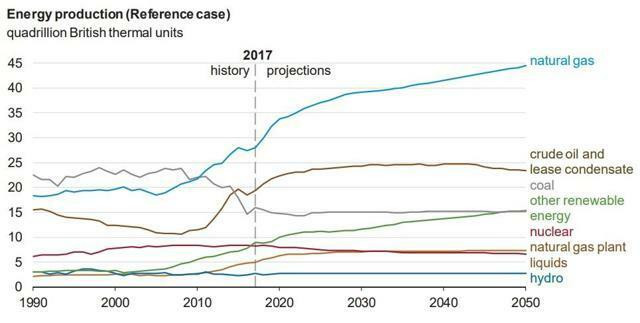 This year’s updated report now puts that peak oil demand estimate at 2036. While that’s closer to the current industry consensus, the point is that long-term demand forecasts can be nearly as volatile as the short-term price of crude itself. Now, of course, the good news is that oil giants are not just in the oil business, but the gas business too. And even with the rapid adoption of electric vehicles or EVs, rising demand for baseload electricity from gas-fired power plants is expected to still see natural gas (and LNG) demand increase through at least 2040 and potentially 2050. But here too we must remember that these long-term projections are merely current best guesstimates that can change over time. Improved renewable energy (including low-cost storage) technology might end up disrupting natural gas power far quicker than most analysts, government agencies, and oil companies currently expect. 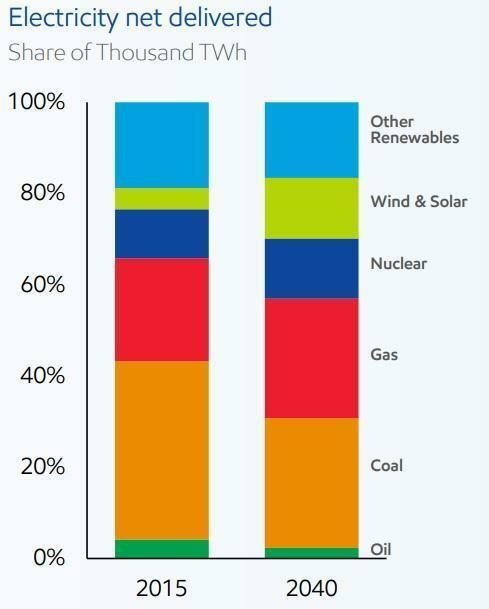 For instance, one analyst at Credit Suisse thinks that renewable energy might “effectively be free” by as soon as 2030. Now I track both the fossil fuel and renewable energy industries closely and while I agree that renewables + storage prices will drop substantially over time, I consider such a forecast to be highly unlikely. But the point is that even if natural gas isn’t made obsolete within the next decade, today’s oil & gas investors are relying on a far longer growth runway that might actually exist. seemingly never-ending lawsuits filed by US cities and states over climate change in an attempt to recreate a tobacco industry-style class action mega-settlement. With so many risk factors to content with conservative income investors are better off sticking with time-tested blue-chips like Exxon, Chevron and Shell. These companies have not just the enormous financial resources to deal with inevitable setbacks but are also the most likely to be able to eventually transition to a renewable energy-focused future. Or to put another way, while most oil stocks are unlikely to be “buy and hold forever” investments, these three giants are the most likely to be able to eventually pivot and not just survive in the coming decades, but thrive and continue delivering solid income quarter after quarter. And thanks to the most recent oil bear market, all three of these high-yield blue-chips are once more trading at attractive valuations that make them good buys today. However, Exxon is by far the most undervalued which makes it my top recommendation for conservative income investors looking for direct exposure to the oil industry. How Did the 'Freedom From Facebook' Campaign Get Its Start?